Ia��VE always worn my Kancheea��puram silks,a�? says Pheroza Godrej, acclaimed historian and guardian of the Parsi communitya��s culture and heritage. a�?Though people are asking me why I have not worn a traditional Parsi a�?Garaa�? (embroidered sari), today. We are sitting at Amethyst, where the Crafts Council of India is holding an exhibition of heritage textile embroideries, with talks and lectures. The first evening is devoted to the revival of the rich Chinese-inspired motifs in satin thread on fine Shantung silk by designer Ashdeen Lilaowala, many of which have a motif of white cranes flying across black silk. Pheroza by contrast wears an olive green sari with a coral border and matching coral beads. Her hair, blunt cut at the ends, hangs in straight folds across her back. It is the color of maple leaves in autumn, rust brown. She worries that she is looking tired but when she smiles for the camera, her face lights up. She glows. The light sprinkling of freckles that fan across her delicate skin gives her the look of a very young person with lips as ripe as the persimmons that are also a feature of Chinese embroidery. It reminds me of the younger version of Pheroza, sitting in the grand library of the Bombay University, as it was then known, studiously taking notes from the venerable old tomes on English Literature. She was at that time a student of Nissim Ezekiel, teacher, poet, philosopher and guide. He became one of her mentors when she started an art gallery called Cymroza at Mumbaia��s famous Breach Candy area, that in those momentous times of the early 1970s had witnessed the daring act of Protima Bedi streaking through its pavements. It was a time for daring acts. Vijay Tendulkara��s play Gidhadhe or The Vultures was performed to horrified acclaim and Pheroza had a lead role. It was later to be banned (the moral police was active even then). Cymroza was an informal space for artists and creative spirits that opened in October 1971. Because of Pherozaa��s interest in theatre, the Alkazis from Delhi supported her cause. There were poetry readings, music and drama performances, ceramic and textile artists as well as filmmakers. a�?Haku Shah had his show with us. Today, at 92 he is showing with us again,a�? she exclaims. Rekha Roddwittiya, Krishnamachari Bose, Laxma Gowd, the Bengal artists all came to Cymroza. They were the new wave. This may explain why today, Pheroza is on different committees on the arts and culture. 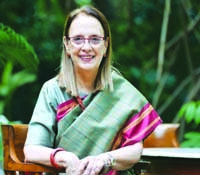 She is the Chairman of the Advisory Committee for the NGMA, a supporter of the Bose-inspired Kochi-Muziris Biennale project. Quite apart from these, there has been a steady involvement in her Parsi heritage. It extends to the saving of the mangroves at the thousand acre Godrej Creek, close to Mumbai. a�?Ita��s saving our earth,a�? she declares. a�?Ita��s our most precious resource, like this garden.a�? A koel streaks through the branches. The evening rays gild her face. Pheroza Godrej is a gentle activist.